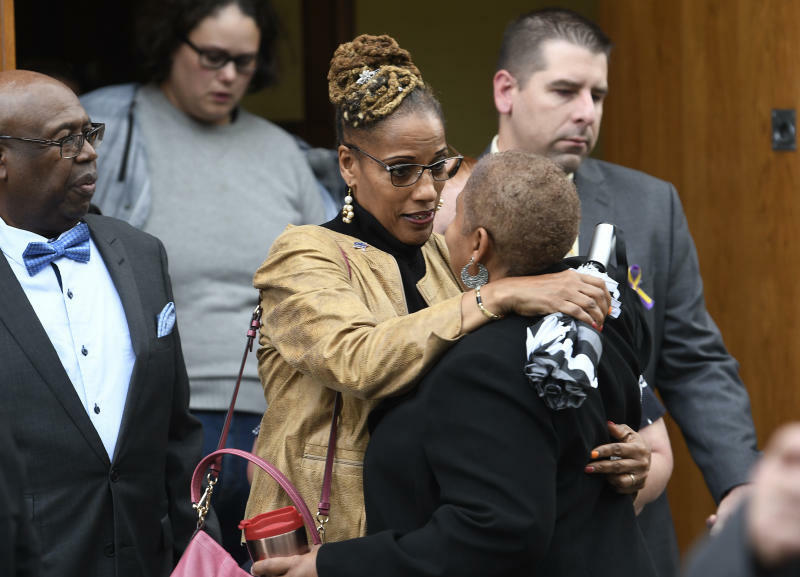 AMSTERDAM, N.Y. (AP) — Mourners at a funeral for four sisters and their family members killed in a New York limousine crash were assured Saturday that their loved ones can still see their tears and feel their heartache. On a damp, chilly day, hundreds of people packed the pews of an old brick church in Amsterdam at the service for eight of the 20 people killed last Saturday when the limousine they hired for a 30th birthday celebration crashed. The stretch limo barreled down a hill past a stop sign into another vehicle in the parking lot. All 17 passengers and the driver were killed, as well as two pedestrians standing in the parking lot. "The question that is in the hearts of so many is: Why?" The Rev. O. Robert DeMartinis told hundreds of mourners. "Why did these 20 individuals have to be taken from us so quickly and so unexpectedly?" 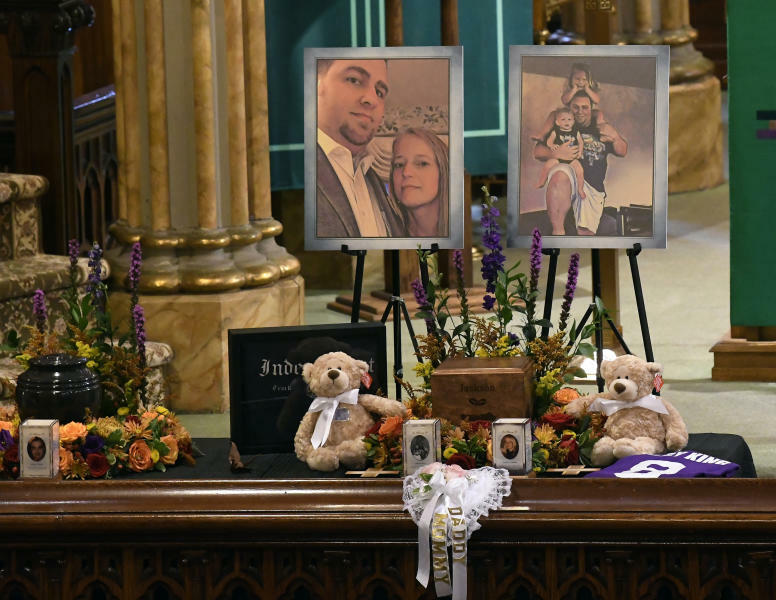 DeMartinis spoke on an altar flanked by pictures of Allison King, sister Abigail Jackson and her husband Adam Jackson, sister Mary Dyson and her husband Robert Dyson, sister Amy Steenburg and her husband Axel Steenburg and his older brother, Richard Steenburg. 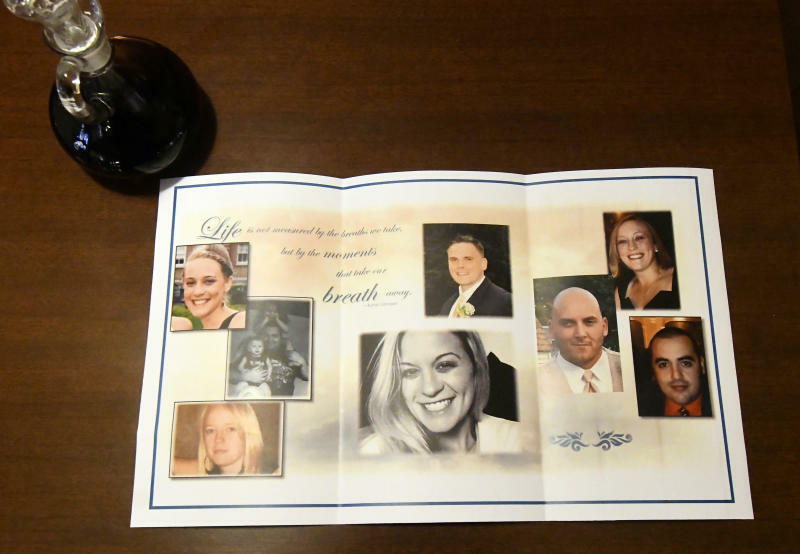 Urns containing their remains were placed beneath the pictures, with each of the three married couples sharing urns. Five teddy bears lay by the urns, one for each young child who lost a parent. A week ago, the group — most of them in their 30s — was headed to a birthday party for Amy Steenburg at a local brewery in Cooperstown. DeMartinis said he believes Amy and her friends were able to celebrate Amy's 30th birthday, but in their afterlife. He told mourners to take solace in their eternal life. DeMartinis married Amy and Axel Steenburg in June. He recalled them as a laughter-loving couple who made a sign asking wedding guests not to take pictures, because "we suggest that you live in the moment." He had wondered why they never picked up the sign. Now, he said, he knew. "That's what they're asking me to ask you to do today," DeMartinis said, holding the sign aloft. The sisters grew up in Amsterdam, a small upstate New York city, and many of the victims have deep ties to the area. The city has been stricken with grief amid a series of funerals. Meanwhile, authorities continue to investigate the cause of the crash while prosecutors have charged the operator of the limo company, Nauman Hussain, with criminally negligent homicide, saying he allowed an improperly licensed driver to operate an "unserviceable" vehicle. Thousands came together for a candlelight rally by the Mohawk River on Monday night, and thousands more attended calling hours Friday evening for the sisters and their family members. "What good can come from this tragedy?" DeMartinis asked the packed church as he spread his arms wide. "Take a look - thousands and thousands of people." This story corrects the spelling of DeMartinis.